“Oh, East is East, and West is West, and never the twain shall meet,” wrote Rudyard Kipling in his famous poen, “The Ballad of East and West,” and it is just as fitting a description of Toonol and Phundahl which inhabit the eastern and western boundaries of the Great Toonolian Marshes on Barsoom respectively. These two cities, as we shall see, are polar opposites of each other and eternal enemies. Toonol is atheistic and Phundahl – as can be imagined by its name – fosters a fundamentalistic religion that is even more absurd than that of Issus. ERB wrote this masterpiece in 1927, ten years before Kipling died, but its lessons are just as valid today as they were then, especially with the West's protracted war with the radical, militant Islam of the Middle East. But, as socially relevant as it might be, ERB never intended to let religion, philosophy, or politics interfere with a rousing good adventure story. And that is exactly what The Master Mind of Mars serves up, the sixth novel in the Barsoom saga, where we are introduced to these two rival city states. emotions after reading the Barsoom novels. Note the idea of believers in ERB’s Barsoom as the “chosen ones,” as well as the idea of the letter being transmitted by means of “one who is greater” than both of them. One could assume that he was talking about Ras Thavas, the Master Mind of Mars, but the idea of a Higher Power – the God of Mars – seems to be the more obvious reference. Perhaps ERB thought he was going too far with this last concept, a problem which he took care of with the invention of the Gridley Wave shortly thereafter, which served him well in later novels dealing with Barsoom, Tarzan, and Pellucidar. A. The Island of Dr. Thavas. “He appeared to be quite an old man, for he was wrinkled and withered beyond description. His limbs were emaciated; his ribs showed distinctly beneath his shrunken hide; his cranium was large and well developed, which, in conjunction with his wasted limbs and torso, lent him the appearance of top heaviness, as though he had a head beyond all proportion to his body, which was, I am sure, not really the case. Paxton witnesses the old man making incisions in the man he had just killed, then inserting tubes which drain the body of its precious fluids, replacing them with somekind of preserving fluid. They go into another room where an old woman seeks aid from the old man. “‘Sentiment is indeed a bar to all progress. We of Toonol are probably less subject to its vagaries than most other nations upon Barsoom, but yet most of my fellow countrymen are victims of it in varying degrees. It has its rewards and compensations, however. Without it we could preserve no stable form of government and the Phundalians, or some other people, would overrun and conquer us; but enough of our lower classes have sentiment to a sufficient degree to give them loyalty to the Jeddak of Toonol and the upper classes are brainy enough to know that it is to their best interests to keep him upon his throne. “He led me immediately to a lofty tower that rose at the corner of the largest building of the group that comprised his vast establishment. Within was a circular runway which led not only upward, but down as well. This we ascended, passing openings at each floor, until we came at last out upon its lofty summit. “About me spread the first Barsoomian landscape of any extent upon which my eyes had yet rested during the long months that I had spent upon the Red Planet. For almost an Earthly year I had been immured within the grim walls of Ras Thavas’ bloody laboratory, until, such creatures of habit are we, the weird life there had grown to seem quite natural and ordinary; but with this first glimpse of open country there surged up within me an urge for freedom, for space, for room to move about, such as I knew would would not be long denied. “Directly beneath lay an irregular patch of rocky land elevated perhaps a dozen feet or more above the general level of the immediatel surrounding country. Its extent was, at a rough guess, a hundred acres. Upon this stood the buildings and grounds, which were enclosed in a high wall. The tower upon which we stood was situated at about the center of the total area enclosed. Beyond the outer wall was a strip of rocky ground on which grew a sparse forest of fair sized trees interspersed with patches of jungle growth, and beyond all, what appeared to be an oozy marsh through which were narrow water courses connecting occasional open water – little lakes, the largest of which could have comprised scarce two acres. The landscape extended as far as the eye could reach, broken by occasional islands similar to that upon which we were and at a short distance by the skyline of a large city, whose towers and domes and minarets glistened and sparkled in the sun as though plated with shiny metals and picked out with precious gems. Vad Varo then spies Great White Apes emerge from the patches of jungle on their island and Ras Thavas tells them that they serve a dual purpose: they keep out assassins from Toonol and they prevent desertion from his slaves and assistants. To get around this, Vad Varo plans his escape so that he can return with Valla Dia’s true body, currently possessed by Xaxa. Hovan Du, a Great White Ape that has had half of his ape brain transferred into that a human, and half of the human's – Hovan Du’s – transferred into the Great White Ape’s. Hovan Du's human half brain is dominant in the Great White Ape and makes a perfect ally. 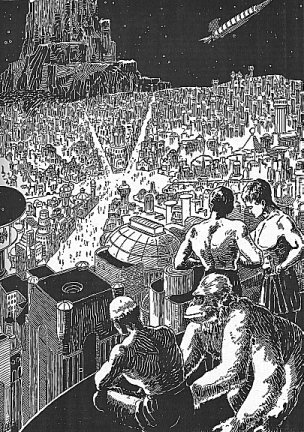 “From the summit of the landing tower I had my first view of a Martian city. Several hundred feet below me lay spread the broad, well-lighted avenues of Toonol, many of which were crowded with people. Here and there, in this central district, a building was raised high upon its supporting, cylindrical metal shaft; while further out, where the residences predominated, the city took on the appearance of a colossal and grotesque forest. Among the larger palaces only an occasional suite of rooms was thus raised high above the level of the others, these being the sleeping apartments of the owners, their servants or their guests; but the smaller homes were raised in their entirety, a precaution necessitated by the constant activities of the followers of Gor Hajus’ ancient profession that permitted no man to be free from the constant menace of assassination. Throughout the central district the sky was pierced by the lofty towers of several other landing stages; but, as I was later to learn, these were comparatively few in number. Toonol is in no sense a flying nation, supporting no such enormous fleets of merchant ships and vessels of war as, for example, the twin cities of Helium or the great capital of Ptarth. “A peculiar feature of the street lighting of Toonol, and in fact the same condition applies to the lighting of other Barsoomian cities I have visited, I noted for the first time that night as I waited upon the landing stage for the return of Bal Zak with the watchman. The luminosity below seemed confined directly to the area to be lighted; there was no diffusion of light upward or beyond the limits of the lamps were designed to light. This was effected, I was told, by lamps designed upon principles resulting from ages of investigation of the properties of light waves and the laws governing them which permit Barsoomian scientists to confine and control matter. The light waves leave the lamp, pass along a prescribed circuit and return to the lamp. There is no waste nor, strange this seemed to me, are there any dense shadows when lights are properly installed and adjusted; for the waves in passing around objects to return to the lamp, illuminate all sides of them. “We therefore found the doors of the depot open and Gor Hajus and Dar Tarus quickly selected four equilibrimotors and adjusted them upon us. They consist of a broad belt, not unlike the life belt used aboard trans-oceanic liners upon Earth; these belts are filled with the eighth Barsoomian ray, or ray of repulsion, to a sufficient degree to just about equalize the pull of gravity and thus to maintain a person in equilibrium between that force and the opposite force exerted by the eighth ray. Permanently attached to the back of the belt is a small radium motor, the controls of which are upon the front of the belt. Rigidly attached to and projecting from each side of the upper rim of the belt is a strong, light wing with small hand levers for quickly altering its position. “Mu Tel took me to a small auditorium in his palace that reminded me somewhat of a private projection room on Earth. It had, I should say, a capacity of some two hundred persons and was built like a large camera obscura; the audience sitting within the instrument, their backs towards the lens and in front of them, filling one entire end of the room, a large ground glass upon which is thrown the image to be observed. “He lighted a small radio bulb between us and I saw a globe there, a globe of Earth, and a small pointer fixed over it. Vad Varo finds much to criticize about this philosophy, finding them, despite their vaunted view of science, that they are much in the same way as religious fanatics, and thus unbalanced. Vad Varo decides it is time to go to Phundahl and fulfill his plan to return the rightful body to Valla Dia. “As we went we approached a great building of wondrous beauty in and out of which constant streams of people were streaming, and when we were before it, Dar Tarus asked us to wait without as he must enter. When I asked him why, he told me that this was a temple of Tur, the god worshipped by the people of Phundahl. “In silence the Toonolian took a few pieces of money from one of his pocket pouches and handed them to Dar Tarus, but I could see that it was only with difficulty that he hid an expression of contempt, since the Toonolians are atheists. “The enormous floor was unbroken by a single pillar and arranged upon it at regular intervals were carven images resting upon gorgeous pedestals. Some of these images were of men and some of women and many of them were beautiful; and there were others of beasts and of strange, grotesque creatures and many of these were hideous indeed. The first that we approached was that of a beautiful female figure; and about the pedestal of this lay a number of men and women prone upon the floor against which they bumped their heads seven times and then arose and dropped a piece of money into a receptacle provided for that purpose, moving on then to another figure. The next that Dar Tarus and I visited was that of a man with the body of a silian, about the pedestal of which was arranged a series of horizontal wooden bars in concentric circles. The bars were about five feet from the floor and hanging from them by their knees were a number of men and women, repeating monotonously, over and over again, something that sounded to me like, bibble-babble-blup. “Dar Tarus and I swung to the bars like the others and mumbled the meaningless phrase for a minute or two, then we swung down, dropped a coin into the box, and moved on. I asked Dar Tarus what the words were that we had repeated and what they meant, but he said he did not know. I asked him if anyone knew, but he appeared shocked and said that such a question was sacrilegious and revealed a marked lack of faith. At the next figure we visited the people were all on their hands and knees crawling madly in a circle about the pedestal. Seven times around they crawled and then they arose and put some money in a dish and went their ways. At another the people rolled about, saying, ‘Tur is Tur; Tur is Tur; Tur is Tur,’ and dropping money in a golden bowl when they were done. “‘What god was that?’ I whispered to Dar Tarus when we had quit this last figure, which had no head, but eyes, nose and mouth in the center of its belly. “‘Was that Tur?’ I inquired. “‘Well, what are these?’ I insisted, with a sweep of a hand that embraced the several score images about which were gathered the thousands of worshippers. “He led me next to the figure of a monstrosity with a mouth that ran entirely around its head. It had a long tail and the breasts of a woman. About this image were a great many people, each standing upon his head. They also were repeating, over and over, ‘Tur is Tur; Tur is Tur.’ When we had done this for a minute or two, during which I had a devil of a time maintaining my equilibrium, we arose, dropped a coin in the box by the pedestal and moved on. “‘It sounded the same to me,’ I insisted. “‘Ah, but that is the beauty of the religion of Tur,’ he exclaimed, ‘it has no mysteries. It is simple, natural, scientific and every word and work of it is susceptible of proof through the pages of Turgan, the great book written by Tur himself. “‘But it was Gor Hajus who told me most about the religion of Tur one day when Dar Tarus was not about. He said that the Phundalians maintained that Tur still created every living thing with his own hands. They denied vigorously that man possessed the power to reproduce his kind and taught their young that all such belief was vile; and always they hid every evidence of natural procreation, insisting to the death that even those things which they witnessed with their eyes and experienced with their own bodies in the bringing forth of their young never transpired. 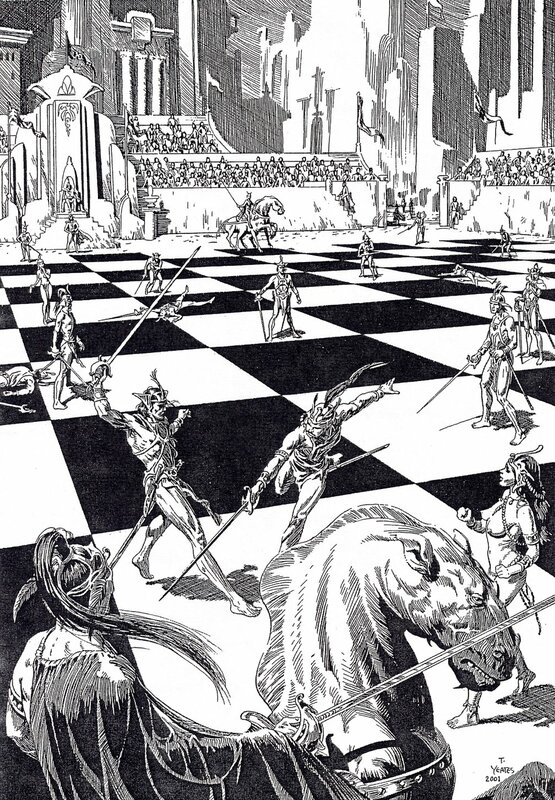 “Turgan taught them that Barsoom is flat and they shut their minds to every proof to the contrary. They would not leave Phundahl far for fear of falling off the edge of the world; they would not permit the development of aeronautics because should one of their ships circumnavigate Barsoom it would be a wicked sacrilege in the eyes of Tur who made Barsoom flat. 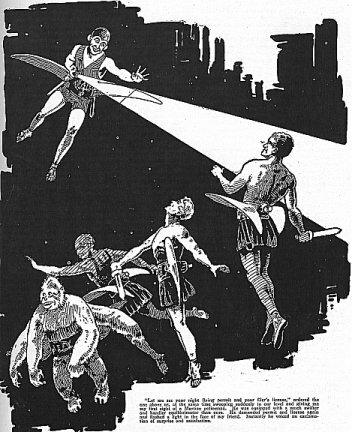 “They would not permit the use of telescopes, for Tur taught them that there was no other world than Barsoom and to look at another world would be heresy; nor would they permit the teaching in their schools of any history of Barsoom that antedated the creation of Barsoom by Tur, though Barsoom has a well authenticated written history that reaches back more than one hundred thousand years; nor would they permit any geography of Barsoom except that which appears in Turgan, nor any scientific researches along biological lines. Turgan is their only text book – if it is not in Turgan it is a wicked lie. As the story progresses, they come across a huge idol of Tur in the Jeddara’s temple, which allows more fun and priest trickery to unfold. But I will allow the reader to enjoy that on his or her own, the main point of this discourse being finished. “Ras Thavas was as remarkable as the things he accomplished. He was never intentionally cruel. He was not, I am sure, intentionally wicked. He was guilty of the most diabolical cruelties and the basest of crimes; yet in the next moment he might perform a deed that if duplicated upon Earth would have raised him to the hightest pinnacle of man’s esteem. Though I know that I am safe in saying that he was never prompted to a cruel or criminal act by base motives, neither was he ever urged to a humanitarian one by high motives. He had a purely scientific mind entirely devoid of the cloying influences of sentiment, of which he possessed none. His was a practical mind, as evidenced by the enormous fees he demanded for his professional services; yet I know that he would not operate for money alone and I have seen him devote days to the study of a scientific problem the solution of which could add nothing to his wealth, while the quarters that he furnished his waiting clients were overflowing with wealthy patrons waiting to pour money into his coffers. We face the same dilemma today with single cell stem research. We must beware the extremes of both Toonol and Phundahal as we move forward on this great quest. The whole idea of brain transplants ERB raised in this story is gripping in the metaphysical dilemma it poses. Where does the soul dwell, if there is one? Is the brain merely another organ like a heart or kidney that does not effect the “I-ness” of a person if it is transplanted. Or is it that part of a person that is indispensable to an individual? it or God would punish us. I was afraid to even read it, but I must say, I enjoyed the pictures of all of the battles in the Old Testament. religious shrine in America is the Mormon Tabernacle in Salt Lake City, and it makes me wonder how such an absurd religion can capture the hearts and minds of so many educated people, who wear magic underwear and perform secret magical rites in their temples. In Robert Heinlein’s future history of the world, outlined in the Forties, he prophesied that America would experience a Mormon like theocracy in this century. Stranger in a Strange Land is a story from this period. When I see a Mormon candidate for President of the United States being viewed as a viable candidate, as well as the insanity of the Tea Party Movement, it makes me wonder if Heinlein was right. God help us all if he was. ERB’s Toonol and Phundahl: the Second Runner-up in the Seven Wonders of Barsoom!